An ambitious, if not entirely successful, synthesis of the old-fashioned, pious ideals of Sebastian Bach and the newfangled values of the enlightened monarch Frederick the Great. 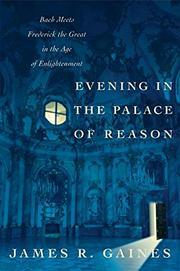 Gaines’s history of the dawning Enlightenment in the German states is dazzling but somewhat fractured, since Frederick was twenty-seven years older than Bach and the two didn’t actually meet until Bach was 62, three years before his death in 1750. That meeting, in Potsdam, between the foremost adherent of the esoteric theory of counterpoint and the fashionable, not-easily-impressed philosopher king proved “the tipping point,” Gaines asserts, “between ancient and modern culture in the West” and resulted in Bach’s magisterial closing statement, The Musical Offering. American journalist Gaines (Wit’s End: Days and Nights of the Algonquin Round Table, 1977), now Paris-based, ranges across the century in order to capture the backgrounds of the men: first, we have Bach’s Baroque roots in a long line of church musicians from Thuringia, culminating in his post as Royal Composer to the Leipzig court; then we have Frederick’s ascension to the Hohenzollern throne at twenty-eight, after a childhood under the abusive treatment of his autocratic father. The education of the crown prince makes the more compelling story, as he hides his love of music and all things French and eventually is imprisoned for plotting to flee his father’s violent treatment. But chapters on Bach—however mesmerizing to the musician—tend to mire down in notions of making “sermons in sound” and theories of composition. Bach’s work wasn’t published or played outside of Leipzig until long after his death, while the world considered his son Carl (C.P.E. Bach), Frederick the Great’s keyboard composer for thirty years, the greater musician. In the end, Frederick steals the show here as Gaines offers up a twin-faceted treatment of the ideas of the age—in a work that’s not easily classifiable as music or history but is composed with a refreshingly nonscholarly flourish. A bit of a stretch, but it’s a light-pedaling, virtuosic work of epistemology.